One of the aesthetic goals in many rhinoplasty cosmetic surgery procedures is to rotate the tip. Rotation of the tip means that the angle that the tip makes as it comes away from the face is altered. Rotating the tip refers to tilting it upwards while de-rotating involves tilting the tip downwards. In many cases, as the nose tip cartilages become softer, they have a tendency to tilt downward. Therefore, a majority of patients ask for an upward tip rotation. This alters the angle between the lip and nose without necessarily causing changes to the tip length regarding its distance from the nose. The most suitable tip position depends on various factors such as an individual’s ethnicity, gender, and height of the nose. For instance, surgeons commonly seek to tilt the nose tip up in women more so than in men as a slightly upward rotated tip is a more feminine characteristics. 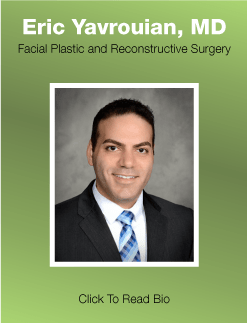 Experienced facial plastic and reconstructive surgeon Dr. Eric Yavrouian provides nose tip rotation and reduction surgery to patients in Glendale, Pasadena, Burbank, Greater Los Angeles, Beverly Hills, CA, and surrounding locations. The tip of the nose is considered a distinct area of the of the rhinoplasty surgery due to its animation and mobility. The goal is to design a defined, stable, and correctly projecting tip that is symmetric on frontal and basal views, triangular on basal view, and appears natural and proportional with other facial features. Every person has a unique nasal structure and anatomy. Therefore, no single nasal tip refinement technique suffices for numerous anatomical variations. Therefore, the surgeon will customize the procedure according to the patient’s specific requirements. The primary goal is to satisfy the patient’s cosmetic, functional, and psychological desires for the procedure. The surgeon will seek to refine the nasal lobule to make it more symmetrical and harmonious with the other nasal characteristics. The columella should be symmetric and it should have the correct relationship with the alar margins. There should be an appropriate nasal base width and nostrils should be of proper size and shape. To correct excessively flared nostrils, the surgeon will place an incision at the nostril’s base and then use sutures to decrease the ‘flare’. At times, the area between the nostrils is excessively wide. The means the nose has what is known as “a wide base”. In this case, the surgeon will place an incision the nostrils’ base and use sutures to bring the nostrils closer together. Other types of nostril and tip refinements can also be performed. However, you must consult an expert plastic surgeon who can offer you the right advice on possible nasal corrections through nose surgery or tip-only rhinoplasty surgical procedures.